What matters more to your employer? Whether your company's goals are met -- or whether your personal and professional goals are met? The answer may surprise you. A few weeks ago, I had to good fortune to run into an old boss of mine, Piers Plowright. He was one of the first people I worked for at the BBC, and one of the best. Much to my amazement, I discovered that he was now retired but not at all to my amazement, that he was enjoying his retirement immensely. "From time to time, they ask me back to do something for them," he said. "I try not to go back too often. I just think it's better for everyone to move on without me." We hope you will join us as the WITI Foundation holds its annual WITI Hall of Fame event, a fund raiser to raise awareness of the accomplishments of women in science & technology and to encourage young girls and women to pursue careers in technology and become technology literate. Please invite your network: organizations and individuals committed to demonstrating their support for the accomplishments of these extraordinary women to attend this event; make a donation by purchasing a table for your colleagues, customers and partners; and champion support for this event in your company. Turn on the radio or TV and you will hear several times each day, "Refinance now! Low interest rates! Pay off high interest rate credit cards!" Sounds good, doesn't it? Who doesn't want to lower their home mortgage interest rate and be able to eliminate those nasty high interest monthly credit card payments? It seems like a great deal! But there is a very real hidden danger to this plan. Register today for Marilyn August's teleclass, "Journey to Wealth and Wisdom"
The next issue of WITI FASTTRACK closes November 11. Click here for more information or contact Cindy Zauss at [email protected]. US firms have jumped onto the bandwagon of "virtual teams." Virtual teams offer irresistible opportunities to bring in specialists from anywhere in the world with no travel costs. With available information technologies (IT), we now can collaborate instantaneously with many others across any distance. Businesses can learn faster, bring products to market sooner, solve problems and create new value. Suddenly many of us participate in, or lead, a virtual team. Like so many other things in the tumultuous marketplace, successful virtual teamwork is harder than it looks. Research consistently shows that teams succeed when everyone participates, feels a part of a cohesive group and project, has sufficient trust to act autonomously and communicates well on interdependent tasks. Factor in the distance between teammates and their dependence on IT, and even the simplest coordination or communication gets more complicated. Nance, as a WITI Member, submitted this article to WITI for publication. Do you have expertise to share? WITI gladly accepts submissions for publication. For more information or to make a submission, please visit the Members' Area. Product launch is not well understood, but Catherine Kitcho is trying to change that. Known as the Launch Doctor, she has spent ten years helping companies and entrepreneurs launch their products, writing several books along the way. Through her work, she has created and evolved a whole new business discipline. In her latest book, High Tech Product Launch - Second Edition, Catherine has captured the best practices of product launch that companies of any size can use to launch any type of product or service. Some people define "launch" as a one-time product announcement. In fact, the practice of launch includes all of the work done during the three months before a product is made available to the market, requiring a unique blend of marketing and project management skills. The challenge is how to do all of that work in a short and chaotic period of time, according to Catherine Kitcho. In her efforts to help people learn and apply this new business discipline, Catherine uses a simple and realistic approach. High Tech Product Launch - Second Edition guides the reader through the entire launch process step by step, from data gathering and market analysis to strategy to launch implementation. The book is now available from the publisher at www.pelepubs.com for $29.95 (ISBN: 1929936044, 259 p.). 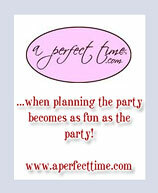 A Perfect Time is your source for event planning at its best! We offer a wide variety of custom invitations, announcements and personalized party favors that we have personally created just for you! In addition, we offer some of your favorite designer collections from Birchcraft Wedding, Birchcraft Holiday, Carlson Craft, McPhersons and Regency. Shop our online catalogs to see thousands of invitations, announcements and gifts at discounted prices! We are committed to providing our clients all of the ingredients for your most memorable social events! A Perfect Time brings friendly service and years of professional expertise to the party-planning process. We offer Event Planning Services that is guaranteed to provide you with unsurpassed quality service. We work closely with our clients to understand their goals and tastes, making sure that planning the party is nearly as enjoyable as the party itself! Please explore our online boutique and see why our customers keep coming back! If you are unable to find what you are looking for, please call or email us to discuss your request. Whatever the occasion is, A Perfect Time is here for you! Enjoy an evening of new ideas and networking on Wednesday, December 7th, 5:30-8:00 p.m. at the Eileen Fisher store at 114 Stanford Shopping Center in Palo Alto, CA. Meet the editors of Enlightened Power: How Women are Transforming the Practice of Leadership (Jossey-Bass: 2005). Hear from the book's editor Ellen Wingard, Executive Coach, as well as co-authors Rayona Sharpnack, Founder and President of the Institute for Women's Leadership, and Susan Schor, Chief Culture Officer of Eileen Fisher, Inc. Susan is the co-author of Eileen Fisher's chapter on how women are transforming power and leadership for greater social, personal and corporate rewards, discussing how leadership has evolved from traditional styles to the inclusive and enlightened leadership practice brought forward by today's great female leaders. The concept of Enlightened Power reflects our current time and increasingly common sensibilities about a workplace that mirrors our society: where women have an increasingly prominent place in leadership. What is Enlightened Power? It is leadership without control and dominance, the "new" reflective style of leadership that is making waves throughout the U.S. and abroad as the most effective form of leadership today. Join us for this special event. Please enjoy a night of shopping and take $25.00 off your purchase that night! For more information and to RSVP, email [email protected].